Explanation: A mere 600 light-years away, M44 is one of the closest star clusters to our solar system. Also known as the Praesepe or the Beehive cluster its stars are young though, about 600 million years old compared to our Sun's 4.5 billion years. Based on similar ages and motion through space, M44 and the even closer Hyades star cluster in Taurus are thought to have been born together in the same large molecular cloud. 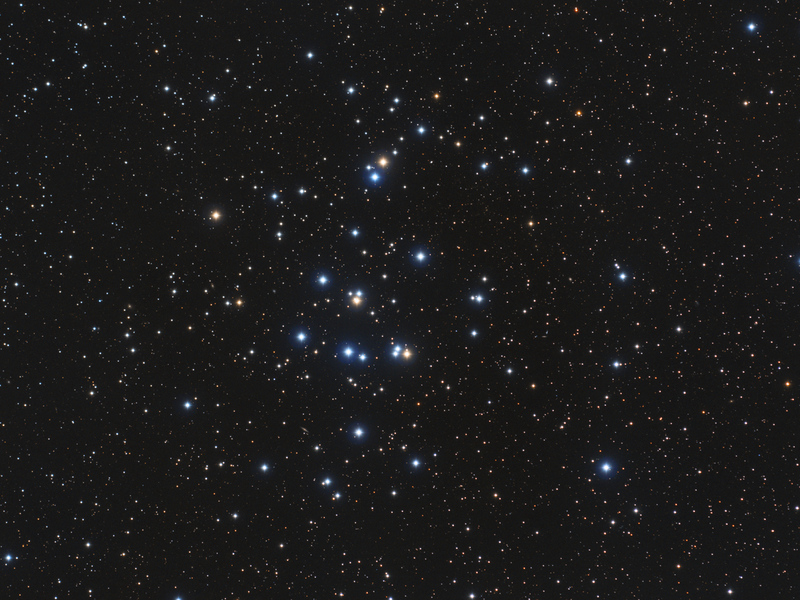 An open cluster spanning some 15 light-years, M44 holds 1,000 stars or so and covers about 3 full moons (1.5 degrees) on the sky in the constellation Cancer. Visible to the unaided eye, M44 has been recognized since antiquity. Described as a faint cloud or celestial mist long before being included as the 44th entry in Charles Messier's 18th century catalog, the cluster was not resolved into its individual stars until telescopes were available. A popular target for modern, binocular-equiped sky gazers, the cluster's few yellowish tinted, cool, red giants are scattered through the field of its brighter hot blue main sequence stars in this colourful stellar group snapshot.